Just a tiny peek at the progress of the christening gown. This is a portion of the embroidery. I have made more progress since I took this picture a couple of nights ago. It always feels like slow going at this point. I am desperate to make good progress on the hand work this week. I am leaving to go out of town next week for SAGA convention. Sorry for the horrible picture, I took it from my chair at night, hence the ginormous shadow in the right hand corner. 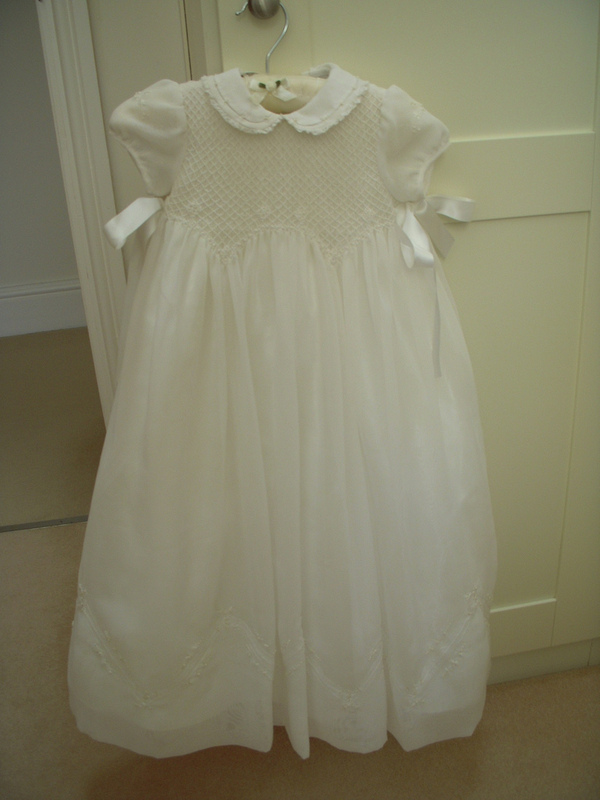 Did you get a peek at the christening gown that Jeannie B posted over at the Old Fashioned Baby Sewing Room? Mine won't be anything like that, but man oh man is that a work of art! And a true family heirloom. I also found this gem on Flickr. I love silk organza. I am not sure if this is silk, but it would be scrumptious made of silk. So pretty. Thank you for your patience. I will be back soon with another peek to share. I am loving the peek! Beeeutiful -- shadow and all! I can tell by the peek that you've got that padded satin stitch mastered. Can't wait to see more. I know it will be breathtaking and perfectly executed. 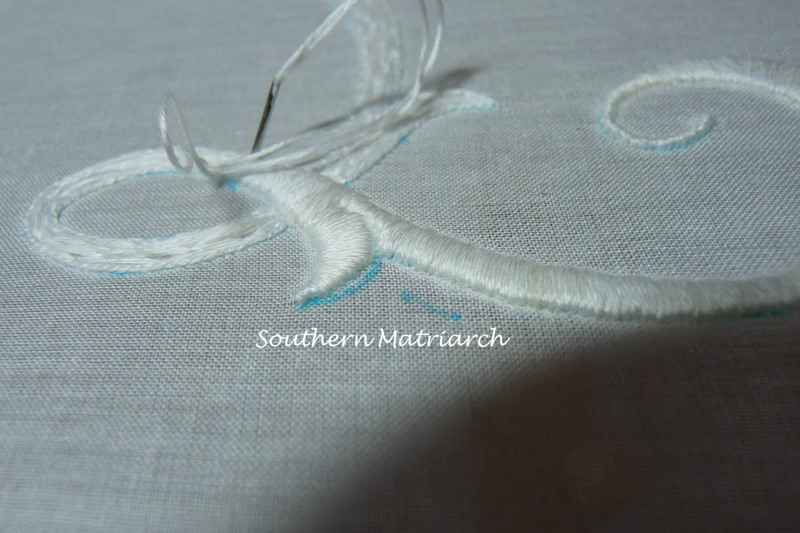 Your padded satin stitch is just perfection. Would love to take a lesson from you. I have always thought that is one of the most difficult stitches to execute well. Have a great time at convention. We want a full report! I can't wait to see the finished gown. I am going to get to make a Christening gown for my daughter's best friend's baby girl. I just found out for sure that she does want me to make it. She's going to send me a handkerchief that belonged to her grandmother. I'm going to incorporate it into the dress some way or other. I can't wait to get it so I can start getting ideas. First I have to make 6 Halloween costumes. I would love to be able to embroider as well as you do! Just beautiful!!!!! You can read the details on my blog. I found this last year and love it. I know you have had great success with the wash away pens, but my well water doesn't like it. If you want to try it let me know and I can drop it buy sometime. I can't wait to see this!!! Your padded satin stitch looks perfect!! !